Jnanadeva (also written as Jnandev, Jnanesvar, Jñanadeva or Dnyāneshwar) was a Hindu saint of the Nath tradition, who lived in Maharasthra in the 13th century during the rule of the Yadava King Ramadevarao, immediately prior to the Islamic invasions of that part of India which started in 1296. Ramadevarao provided a stable and secure government compared with the political turbulence and persecutions which were then taking place in many parts of India, and thus his kingdom attracted saints and scholars and became one of the epicentres of Hinduism in that era. In his short life, which is believed to be no longer than 22 years, Jnanadeva composed a rich body of spiritual writings [Amritanubhava, the Abhangas, the Jnanesvari and the Changadeva Pasashti], which are considered great milestones in Marathi literature. Jnanadeva translated the Bhagavad Gita into Marathi and provided a magnificent and rich commentary, which appealed to common folk as well as great saints and scholars. This work was named Bhavartha Deepika (Light on the Inner Meaning); however it more commonly goes by the name “Jnanesvari” in honour of its composer. This work is still widely studied and recited today. An English translation of the Jnaneshwari is available here. Jnanadeva lived at a time when common folk would would practice forms of religiosity which were not in tune with the main thrust of spiritual Hinduism, and did not provide practical guidance in life, which is supposed to be the journey of the soul to ever greater heights. Most Hindu scholars of the time did not wish to translate central works of Hinduism such as the Bhagavad Gita or the Upanishads into local languages. It was widely held that Sanskrit was the only language fit for this purpose. However the scholars and pandits did not realise that their short-sightedness was depriving the masses of the spirituality and ethical guidance which they needed in their lives. Jnandeva broke this taboo and was one of the foremost pioneers of that time who did this, paving the way for an entire movement which lasted many centuries, in which the core of Hindu spirituality was made easier to read, practice and imbibe. This was instrumental in Hinduism surviving the long hostile medieval period in which much of India was under Islamic rule, by greatly stemming the tide of forced and voluntary conversions away from Hinduism. Amongst Jnandeva’s teachings was the spiritual equality of all castes and backgrounds that made up the Hindu community, the ultimate oneness of Shiva and Vishnu, and an emphasis on physical (hatha) yoga. Amongst the saints who Jnanadeva’s works inspired were – Namadeva, the tailor’s son, Narahari, the goldsmith, Gora the potter, Chokamela and his wife, who from “Dalit” background, and Janabai, the maid servant. Additionally, the entire “Bhakti movement” bears a deep influence from Jnanadeva. In the centuries which proceeded his life, the seed which he created blossomed and many other great seers and upholders of Hinduism in that land came forth, such Eknath, Tukaram and Ramdas. It is not inaccurate to say that the great political renaissance of Hinduism that occurred in Maharasthra which was the first region to decimate the Moghuls owes much to the renewed faith in people’s hearts that was imparted by Jnanadeva, some centuries earlier. Jnanadeva decided on a practice of voluntary ending his life in a state of deep meditation, once he felt that his life mission was complete – he was buried alive in a deep meditative state. It is believed that it was in 1296 that he took his last bath, and descended the steps into the Samadhi that had been prepared for him. 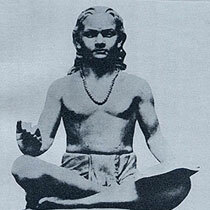 Sitting in the padma yogic position and facing North, he voluntarily released his mortal coil. « Hindu’s lack of activism compared with adherents of other faiths?